Judge David T. Matia and Stephen Johnson Grove, Deputy Director for Policy, Ohio Justice & Policy Center explain. I am the product of the people, a cross section of their community-weak as they are weak, and strong in their strength; believing that knowledge of our failings and our powers begets a greater strength. I have a house of fellowship; under my roof informality reigns and strangers need no introduction. I welcome to my platform the discussion of any theory or dogma of reform; but I bind my household to the espousal of none of them, for I cherish the freedom of every man’s conviction and each of my kin retains his own responsibility. Long out-of-print book written about the Cleveland City Club’s first 50 years. A wonderful description of the people who helped to create The Citadel of Free Speech. The City Club of Cleveland, our citadel of free speech, is still thriving after 100 years. It doesn’t look like anything special at street level, a storefront housing yet another CVS drugstore in yet another American city. But the name on the stone façade of the building at 850 Euclid Ave. — “The City Club of Cleveland” — commands attention and respect. For the last hundred years, the organization has been “a citadel of free speech,” as Executive Director Jim Foster calls it. Many of the speakers and debaters at its 12:30 p.m. Friday forums are instantly recognizable, names such as George H.W. and George W. Bush, Archbishop Desmond Tutu, Jesse Jackson, Ted Turner, Jane Fonda, John Glenn and Muhammad Ali. And over the years its members have included everyone from late Plain Dealer rock writer Jane Scott to former President Bill Clinton. Hewitt Shaw, president of the club’s board of directors, says the club’s long history of attracting distinguished unpaid speakers has created an iconic institution. The City Club of Cleveland was founded in 1912 as a response to the political and social reforms of the day. “The public’s business was coming out of the smoke-filled rooms, of party bosses and municipal bosses pretty much having their way,” Foster explains. Cleveland mayor Newton D. Baker, who went on to establish the law firm Baker & Hostetler, and like-minded individuals such as Alfred Benesch, a founding partner in the law firm Benesch, Friedlander, Coplan & Aronoff and a leading figure in the Democratic Party’s reform wing, came up with the idea of establishing a place where citizens could learn about and openly discuss public policy and social issues. According to Foster, they modeled the City Club after an institution in Boston. Of the 165 Clevelanders invited to attend an Oct. 30 organizational meeting, 111 showed up; 104 agreed to buy $10 shares in the newly incorporated entity. Foster notes that the word “club,” with its inference of exclusivity, was a misnomer from the start. Although women could not join the organization until 1972, it immediately extended membership to men of all races, ethnicities and religions — a radically progressive act in the early 1900s. The new organization hosted its first forum on Dec. 21, 1912. The program consisted of a speech by Toledo mayor Brand Whitlock on municipal ownership of utilities, followed by a question-and-answer session — an hour-long format that endures to this day. The group convened its weekly meetings at various halls until it took up residence on the third floor of Weber’s Restaurant, a popular Superior Avenue eatery, in May 1913. 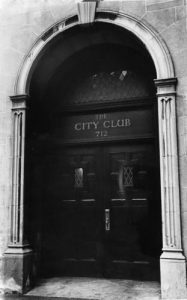 During the next two decades, the City Club made a national name for itself by booking an impressively diverse roster of speakers, including Theodore Roosevelt, women’s-rights activist Margaret Sanger, powerful United Federation of Labor President Samuel Gompers, heavyweight boxing champion Jack Dempsey, famed attorney Clarence Darrow, NAACP co-founder W.E.B. Du Bois, cowboy humorist Will Rogers and Boston retailer Edward Filene. Foreign presenters included Syngman Rhee, first president of the Republic of Korea’s provisional government, and immigrant journalist Ilya Tolstoy, son of Russian novelist Leo Tolstoy. Retired attorney Stanley Adelstein recalls that the City Club was scheduling its forums — preceded by a half-hour lunch, just as they are today — on Saturdays when he first joined in 1941. “People worked a half a day on Saturdays,” he explains. The meetings moved to Fridays in the 1950s. He remembers seeing a picture of picketers protesting an April 1967 appearance by segregationist Alabama Gov. George Wallace on the front of a New York City newspaper during a trip to Europe, and of attending a May 1974 senatorial primary debate between incumbent Democrat Howard Metzenbaum and former astronaut John Glenn. Perhaps the most dramatic event in the City Club’s history, however, was an address delivered by Robert F. Kennedy on April 5, 1968, the day after the assassination of Dr. Martin Luther King Jr. Like many events throughout the organization’s history, it required renting a larger space — in this case, the ballroom of what is now the Renaissance Cleveland Hotel — to accommodate the audience. The former U.S. attorney general and senator, a candidate for the Democratic presidential nomination, spoke about “the mindless menace of violence” instead of politics. It was the only time a City Club guest didn’t take questions from the audience. Foster says Kennedy’s daughter, Kathleen Kennedy Townsend, told him it was her father’s most notable speech. In 1971 the organization left its clubhouse — one of the buildings torn down to make way for National City Center (now known as the PNC Bank building) — for offices and dining/meeting space in the Women’s Federal Savings & Loan building on Superior Ave., near Public Square. The club moved to its current home in the former Citizens Federal Savings & Loan building at East Ninth Street and Euclid Avenue in 1982. The building’s Columbus-based owner put the City Club’s name on the structure after the organization re-signed a lease in 1998. The City Club has changed with the times to retain its approximately 1,000 members and attract new ones. Fifteen years ago, Foster began offering the occasional forum on a different day and time to better accommodate speakers’ and members’ schedules. He hopes “City Club in the City,” a six-year-old program that stages forums out in the community three times a year, and New Leaders, a young-professionals group that meets in the evening every couple of months, will continue to help build a more diversified audience. The organization also continues to use ever-evolving technologies to distribute its programming. Forums are carried live on WCPN-FM and rebroadcast on approximately a hundred other radio stations in Northeast Ohio and around the country. WVIZ-TV televises the most recent program the following Sunday morning. The organization even has its own YouTube channel and poses questions to speakers sent in via Twitter. Foster and Shaw acknowledge that the very digital and social media they’ve embraced present a challenge to luring people out of their offices and homes for a weekly luncheon meeting. Yet the City Club continues to book facilities much larger than its 280-seat dining room for anticipated major draws such as political debates and state-of-the-city and state-of-the-county addresses. Foster says that the Oct. 15 debate between incumbent U.S. Sen. Sherrod Brown and Republican challenger Josh Mandel sold out the Renaissance Cleveland ballroom in 12 days. Shaw believes the opportunity to pose spontaneous, unscripted questions to local, national and world leaders — one of the reasons he became a member seven years ago — remains a part of the forums’ appeal.